Nature's Wonders' premium nuts and dried fruits are carefully handpicked from choice plantations and specialty growers around the world. 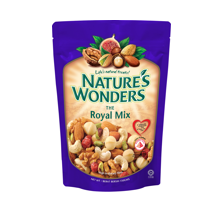 Borne out of its desire to indulge consumers with the purity and freshness of naturally occurring foods, Nature’s Wonders is able to offer minimally processed nuts to our customers. They are the perfect blend of wholesome and natural flavours that not only promise pure and healthy living, but also greatly impress with their delightful taste.